We have just sold 50% of our holdings in Hecla Mining for an average of $11.89 per share. We are taking profits on Hecla as this stock has not corrected with other silver stocks and technically appears to be overbought. We bought Hecla at $5.27 on July 11th 2006 so we are taking a profit of over 125% on this trade. We still firmly believe in Hecla as a silver company and we are confident that the stock's good fundamentals will carry it to higher levels in the longer term. 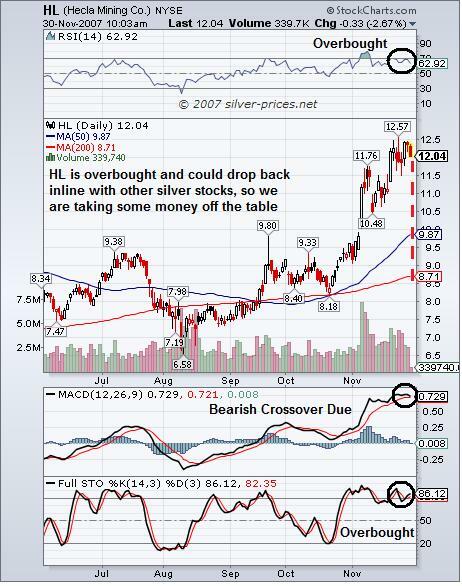 However in the short term we are taking some profits as the stock appears to be technically overbought and has not corrected as other silver stocks have. You can stay updated on trading signals by subscribing to The Silver Prices Newsletter, completely FREE of charge. Simply click here and enter your email address. I recently dumped by Hecla shares because of an email I recieved from them regarding the silver market manipulation. They came up with some story that they had hired an "outside firm" that analyzed the situation and were told that nothing illegal had been done. When I wrote to them inquiring for details, none were forthcoming. If I'm wrong, I'd like to see some evidence, including some specifics about how Hecla's "investigation" was done. In any event, I'm much happier with SSRI. I read the Butler speculation about China, and he could be right. There is a "fly in the ointment" for the manipulators: they can generate all of the paper they want with all of the help of the market regulators, but they can't create one ounce of silver out of thin air. I'm sure the Chinese have some backup silver to keep this going for a while, but what's in it for them to keep this fraud going?